I was invited on a 48-hour getaway with to take the three-hour drive in their from El Paso airport to the quaint destination. While I didn't have as much time as my co-worker on her recent three-day trip, I still managed to see (and do) a ton in this must-see Texan town. 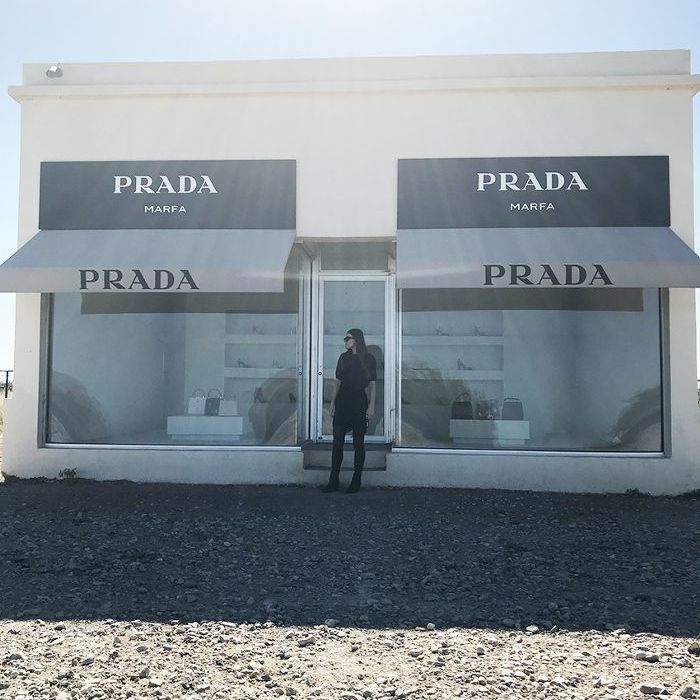 So here are some of the best things to do in Marfa in 48 hours (according to me). Why Go: If you've always been fascinated by the extraterrestrial or wondered if life exists outside our planet, then you'll be astonished by the famous mystery lights and maybe even believe it does. Since the 19th century, people have been traveling to this historic site to witness this phenomenon, and it is unexplained to this day. According to , the "seemingly sourceless lights dance on the horizon southeast of town, an area that is nearly uninhabited and extremely difficult to traverse." Insider Tip: Download a so you can identify all the magical stars, planets, nebulae and more in an open sky that goes for miles and miles, uninterrupted by the light pollution of the city. It's a spectacle beyond the marvel of the lights. Why Go: I was lucky enough to be invited to the for an up-close view of her stunning and incredibly detailed paintings. It wasn't just the works that left me awestruck, but the energy of this creative space was incredibly inspiring. You can't see in this photo, but the corner behind me was filled with paint-covered easels, her artist tools, and instruments all laid out as though she'd just wrapped up a sitting that afternoon. To have the privilege of meeting her and enjoying a meal here was such an honor. Why Go: If there's one place you simply must see in Marfa, it's the with its 15 untitled works in concrete by artist Donald Judd from 1980 to 1984. Located on an old army base (the old barracks have been turned into galleries), this is just one of many large-scale installations on the property, preserved and revered for all to see. We walked through the property to view these concrete structures up close, and we were overwhelmed by the way the light changed and morphed into various shapes throughout the tour. And if you're lucky, like we were, you may come across some of the locals. And we're not talking people either. Some very friendly grazed on the grass around us while we strolled the pathway, and apparently, they get bobcats too. The is a fantastic space for this conversation, and I was lucky enough to witness an installation view of the exhibition titled Annkaylli: Spatial and Ideological Terrain by William Cordova, which really challenges you to view art in a completely new way. Why Go: It's the new hip and happening place to stay, but is more than just good looks. Houston-based Carlos Jiménez was inspired by the sites original hotel that dated back to the 1880s with a nod to modern times, of course. He enlisted the help of local design studio Silla to create the contemporary interior that could easily be at home in New York. Besides that, the service is impeccable, and the food at the hotel restaurant is delicious too. Insider Tip: The owner of the hotel, Tim Crowley, paid homage to the artistic town by filling it with paintings by local artists. They're everywhere. And you can also purchase them and other artwork at the in-house bookstore, , which is also brimming with art books, supplies, local offerings, and memorabilia. Check out a few more of my snaps in the gallery below, and then shop our editor's travel essentials. For more things to do in Marfa, check out . Everywhere you look there's a cool building packed with patina. This one was right next door to where they make beautiful handmade soaps. They smell and look divine, and it's worth a look. I couldn't resist its hinoki soap dish and was tempted to walk away with its hinoki bath mat too, but the trek back would have been arduous. Shame.